The expression “kingdom of Heaven”, in the Greek translation literally means the rule of the heavens over the earth. The Lord Jesus is the King. You can't have a kingdom without a king; neither can you have a king without a kingdom. It is a phrase that is used primarily in Matthew's Gospel and it speaks of the reign of Jesus Christ the Son of David when He occupies the throne of David in Jerusalem. The Kingdom of heaven here on earth is not in existence today. Christ is not reigning over the world now. Although the Kingdom of heaven has not come yet physically, it is in the hearts of those who have received him in baptism, and it was was at hand, or was present, in the Person of the King Himself Jesus Christ. However, He is coming someday to establish His physical kingdom on the earth. When He does, He will put down rebellion. In the book of Daniel 2:44 we read of the Kingdom which “the God of heaven” will set up right here on earth immediately after the destruction of the reign of Antichrist and his armies, and that Kingdom “shall stand forever.” The Kingdom of Heaven of which John the Baptist preached is the Kingdom promised David in II Samuel 7:7-16. The same kingdom is prophesied by both major and the minor prophets. When the angel Gabriel announced to Mary that she would be the mother of God's son, he told her, according to Luke 1:32-33 that Jesus would sit on the throne of David and reign over the house of Jacob. John the Baptist announced the Kingdom of Heaven as “at hand” he continued such announcements throughout his ministry. Jesus also preached the Kingdom until they crucified Him, the King. The shortest route between any two points is a straight line. The shortest route between physical life and eternal life is also a straight line. Moreover, the road to Salvation is both straight (not crooked) and strait (not wide open). On the other hand, those who travel a crooked path (like a serpent), not only expend far more effort to go their greater distance, they may never arrive because, by definition, a crooked path will end up anywhere but the right place, even if one was aiming at it (the result of living life with a "bent sight"). That was the lesson of why the adult Israelites of the Exodus didn't make it to the promised land. The LORD led them straight out of Egypt, straight down to Mount Sinai, and then straight up to enter the land of Israel from the south. But when they became crooked in their obedience to Him, He turned the rebels around and let them wander their crooked path to no where. It was their children and grandchildren, forty years later, who crossed the Jordan. Most of humanity, for the time being, is, as the old saying goes, still "headed no where fast." The world remains a "babylon" of confusion ("babylon" literally means confusion; it originated from a word meaning to babble, like a baby). The world is the way it is today because "there is no judgment in their goings: they have made them crooked paths: whosoever goeth therein shall not know peace." The world's idea of a "leader" is someone who seizes power (by arms or by lies) and pushes, rather than truly leads. The good news however is that the world, in due time, is going to be made straight. Everyone is going to find the "straight and narrow way" - and then have the genuine opportunity to do the right. The spiritual blindness that causes the "aimless" wandering through life will be cured, for the LORD will "lead them in paths that they have not known" and "make darkness light before them, and crooked things straight." One, The first thirty-five chapters speak of judgment. But grace always enwraps the judgment of God, therefore we read of infinite grace in the midst of the horrible judgments prophesied by Isaiah. The second division of Isaiah's prophecy is historic, and is found in the hear of the book-chapters 36 through 39. Isaiah describes the condition of affairs in the days in which he lived, and explains the great burden of judgment which God ordered him to declare to the people. The third division begins with chapter 40 and here begins the paramount message of the book of Isaiah. The preceding thirty nine chapters are in a sense, preparatory to the beginning of the message recorded in chapter 40 and following. He is presented as the Lamb-meek, despised, rejected, smitten, and slain. Thus he came the first time. He is presented as King of Kings, the mighty conqueror, taking vengeance on the nations of the gentiles, This is His second coming-and since the first coming was literally fulfilled as prophesied, why should we not expect a second coming to be literally fulfilled also? 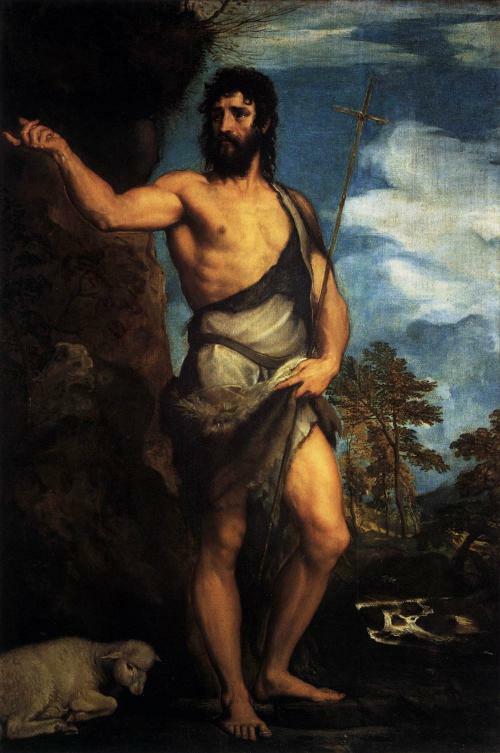 It is from the prophecy of Isaiah that John the Baptist announces the Kingdom of Heaven as “at hand.” He was the voice crying in the wilderness, and his message was “Do Penance”! The King is coming! “Make straight His path.” John the Baptist was the voice Isaiah was referring to centuries before John appeared in the wilderness of Judea.